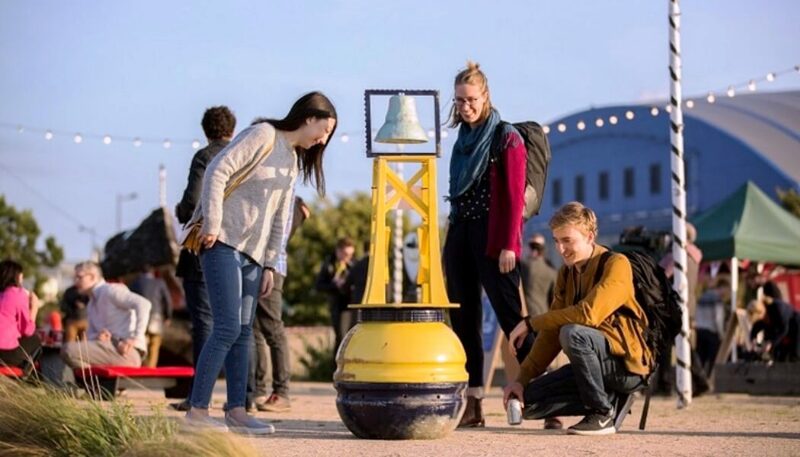 Main Image: Visitors to Cardiff Bay interact with a prototype ‘Digital Town Crier’ that senses their presence and quietly announces special offers nearby. The idea was part of ‘Ideascape: Digital Placemaking for Porth Teigr, Cardiff Bay’. Image by Paul Blakemore. Explore new possibilities in digital placemaking with Calvium’s recent white paper: Digital Placemaking for Urban Regeneration. The end-effect of digital placemaking is to build value in the urban environment. But to fulfil this potential, practitioners should follow a few simple guidelines in their digital placemaking practice. Step forward our four pillars for digital placemaking, the core elements we believe form the foundation of high-quality digital placemaking. We’ve crafted these pillars after building placemaking projects for clients including The Guardian, National Trust, Historic Royal Palaces and local governments over the past decade. Digital placemaking is a people and place-led activity. Digital placemaking projects are not intended to be a showcase for any particular digital technology. As a practice, digital placemaking is focused on a higher goal: to bring people and places together and improve the relationship between the two. In doing so, digital placemaking projects have the power to strengthen the social, cultural, environmental and economic experiences of those living in and using urban spaces – in turn, improving people’s experiences of the public realm. The community and the space in question must determine the technology used to deliver the project. Successful digital placemaking projects are therefore the result of dialogue between those crafting the experience and those experiencing it. Take the Senseable City Lab – a research initiative at the Massachusetts Institute of Technology set up to investigate the ‘digital information blanket’ that increasingly covers our physical landscape from a critical point of view. The Lab’s City Nature Challenge 2018, which ran in April 2018, is a great example of this action. The project shone a light on the great diversity of nature in Boston, encouraging people to document the wildlife they saw throughout the city over the course of a month. The digital platform encouraged real-world action which resulted in a data set that biologists could investigate. This symbiosis between the participants and practitioners is a key characteristic of great placemaking projects. Urban spaces are used and interpreted by individuals in different ways. Practitioners must account for this subjectivity in their work, and the best digital placemaking projects are inherently a collaborative process and not a ‘top-down’ one, a key theme explored at last year’s Digital Placemaking Week in Amsterdam. Successful digital placemaking projects are, accordingly, different to any others that came before because no two spaces or communities – be that stakeholder communities, residents of a place, or visitors – are the same. Digital placemaking should make places better – attracting communities to spend more time there. Governments and regeneration professionals have long acknowledged the importance of placemaking for improving the public realm within urban environments. Digital placemaking not only adds digital technology to placemakers’ creative toolboxes; it uses digital technology’s unique ability to build engagement to create public spaces that anticipate, and exceed, people’s expectations. In turn, these spaces attract individuals to invest time and money there. The practice delivers value for sites new and old – building community in new developments, as we did with the Battersea Power Station app, and fostering connections between existing groups, as with our Jeg ar Norrebro app for Copenhagen neighbourhood Norrebro. Digital placemaking can, therefore, be used by planners and regeneration specialists for building social good, economic prosperity and environmental sustainability. Heritage professionals might also use the practice to create social and cultural capital from the built environment. The award-winning The Lost Palace immersive experience for Historic Royal Palaces built an imagined palace on the streets of Whitehall, taking visitors on a sensory journey around a historic building that hasn’t existed for 300 years. The result? Increased footfall and engagement – and a new appreciation for the historical value of a site that visitors typically bypass on their way to other landmarks. Digital placemaking offers value across all phases of large-scale urban development. The value of digital placemaking isn’t only its effectiveness in driving engagement. Its breadth of application is equally significant, especially for those engaged in urban planning and development. In our recent white paper, we explore the role the practice is playing in the planning, design, construction and management of urban spaces. Public consultation has long posed a challenge for development professionals, but is integral to successful planning. Using digital technology to engage communities can make the process more interesting and relevant to stakeholders of all types – as showcased by our work at Ideascape in Cardiff’s Porth Teigr. There, we designed a series of digital interventions to explore the potential for digital placemaking within development practice. One installation featured a pair of ‘digital binoculars’, providing a 3D view of upcoming construction work. This allowed residents to preview potential architectural developments in a new, immersive format – and encouraged a rich range of critical responses, as a result. Built environments are most effective when they integrate and respond to the needs and views of the communities that use them. This is the dialogue that digital placemaking seeks to encourage – allowing practitioners to design spaces in a sustainable, scalable and flexible manner. The value of digital placemaking doesn’t end once a space is built, of course. The practice can be used to promote and drive communities to reconsider environments, too. Our digital Heritage Trail for the Battersea Power Station Redevelopment Company, for example, was created to accompany the relaunch of the site as a mixed home, retail and business environment – using AR (augmented reality) and locative media to engage the different communities that use the site, and deepen their appreciation for it. Digital placemaking is happening now. Hans Karssenberg, partner of Amsterdam-based independent urban development bureau Stipo, notes that “placemaking is fundamental to understanding how to improve cities.” Digital technology is fundamental to understanding how we exist in those cities. Today, digital technologies are woven into all aspects of our life. Digital placemaking takes this truth and runs with it – bringing digital and physical experiences together to create hybrid spaces that haven’t existed before. Digital placemaking has already proved transformative for boosting engagement in the heritage sector – as exemplified by our portfolio of historical smartphone apps. Elsewhere, the practice is driving engagement with the world of culture – as captured by the Stamfordham digital app trail for families. In Singapore, developers look to the practice to build connections between local startup businesses. For digital placemaking, this is only the start. Ongoing advancements in material and digital technologies will deliver an ever-expanding range of possibilities for ‘physical+digital’ integration to meet the evolving demands of various stakeholder communities, including businesses, residents and visitors. To make this happen, development, regeneration and heritage organisations must stay focused on the fundamentals of effective digital placemaking outlined above. What they do with the practice remains to be seen. Find your device: How should you deliver your app experience?